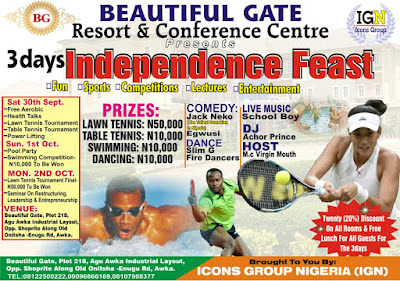 Icons Group Nigeria (IGN), is set to showcase 3 days of Fun, Comedy, Music, sports, competitions, lectures and Entertainment as they Presents Beautiful Gate Independence Feast at Beautiful Gate Resort & Conference Center, plot 218, Agu Awka Industrial Layout, Opposite Shoprite, Along Old Onitsha-Enugu Road, Awka on Saturday September 30 to Monday October 2, 2017. The show which will be hosted by MC Virgin Mouth will also see a live performance by sensational musician, School Boy; with comedy by the tallest comedian in Nigeria Jack Neko and Egwusi (1st Runner-up Xandas Take The Mic) and dance from Slim G and Fire Dancers. 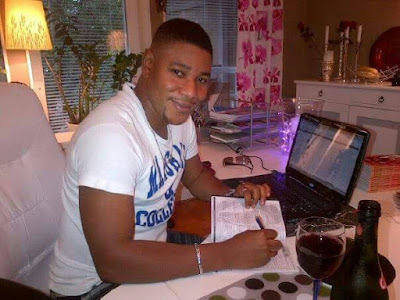 Lawrence Lurrenzo Onuzulike, producer of the award winning movie 'Little Ryan' who is also the CEO of Icons Group Nigeria (IGN), told Omonaijablog exclusively that; "all I wanted is to showcase the talents and beauty of Anambra State and turn the state into a tourist and entertainment hob. Recalled that this year alone, the Lagos based film maker has successfully organized two shows; 'Xandas Take The Mic and Icons Modeling Contest' with winners as well as participants going home with different gifts and rewards. 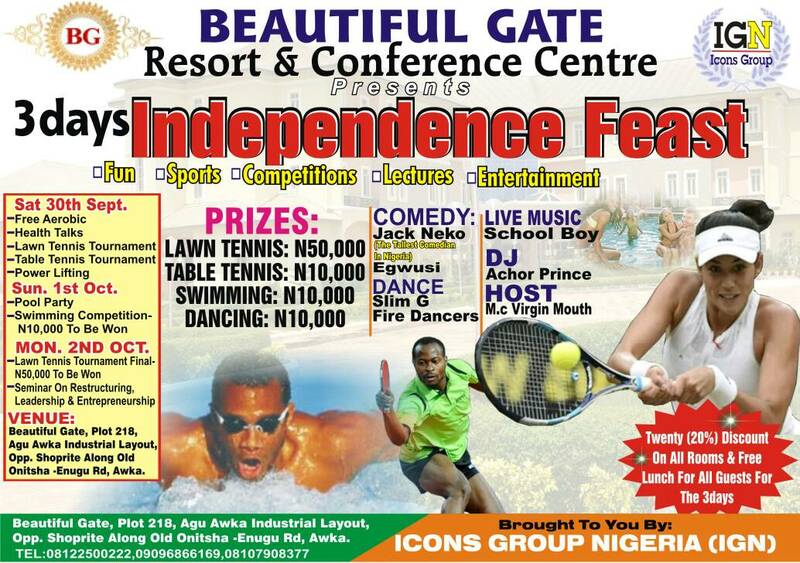 Presents Beautiful Gate Independence Feast will involve Lawn Tennis and Table Tennis Tournament with N50,000 and N10,000 prize money to be won respectively. Winners of Swimming and Dancing contest will go home with N10,000 each. For participation or enquiries contact Icons Group Nigeria (IGN): 08164625777, 07061189122.